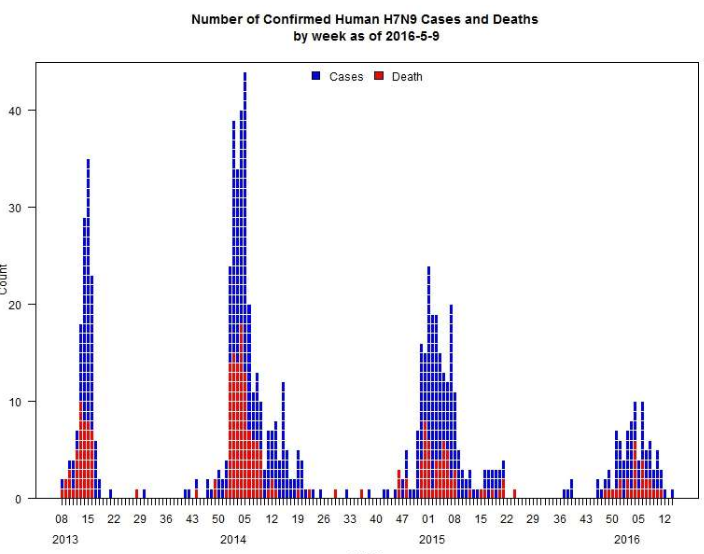 Since it first emerged in 2013, one of the hallmarks of China's yearly H7N9 cycle has been that case reports drop to nearly zero by the end of May, and remain scarce until fall (see WHO Chart above). 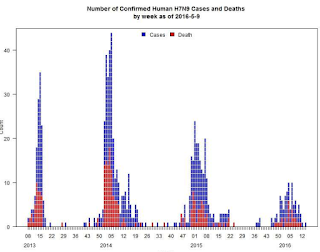 This morning, however, we've reports of at least three new H7N9 cases (2 in Tianjian, 1 in Hebei) and hints of three others (some or all of whom may have fallen ill in May). Over the past 18 months avian flu reporting from China has become fragmented, lacking in detail, and announcements are sometimes delayed by weeks (or even months), all of which lowers our confidence in the data we do have. That said, today Hong Kong's CHP has posted a notification of 6 H7N9 cases on the Mainland. I've tracked down 3 of these and can confirm they are new. June 14, 2016, the city found a case of Hebei to Beijing for treatment of human infection with H7N9 avian influenza. The patient in critical condition, the hospital treated in isolation. Currently close contact with the patient have been identified have been implemented under medical observation, so far found no abnormalities. Patients with Chen, female, 68 years old, Langfang City, Hebei Province farmers, due to critical condition, go to a local hospital by the Hebei city hospital for treatment, the patients visiting hospitals in the city to detect and Beijing Center for Disease Control and Prevention review of patient lower respiratory tract specimens of H7N9 avian influenza virus nucleic acid positive. Not currently found patients had a clear history of exposure to poultry or live bird markets exposure history. June 14, 2016, the city confirmed two cases of human infection with H7N9 avian influenza. Currently these two patients were treated in hospitals by the municipal expert groups. Close contact with patients who have been the implementation of medical observation, so far found no abnormalities. Patients Zhang, who lives in Langfang City, Hebei Province, by the local hospital ambulance sent to the city hospital for treatment; patients Wang, who lives in Tianjin Binhai New Area, because the two people hospitalized with severe pneumonia, and had had a history of exposure to sick poultry. By the Chinese Center for Disease Control and Prevention, Detection review, Tianjin cases LEG comprehensive clinical, laboratory and epidemiological findings, the diagnosis of two cases of human infection of H7N9 avian influenza. Epidemiological survey, two cases of no relevance, is sporadic individual cases. As for the other three . . . one (a 57 y.o. from Hebei) was reported last month, while two others look suspiciously like cases we saw announced (h/t FluTrackers) for May. But without ages, locations, and dates of onset for these cases, we haven't enough data to say with any certainty. Whether it's 3, 4, or 5 new cases, this is an unusual enough deviation from the past to warrant mention. First the Hong Kong Notification, after which I'll have a bit more. The Centre for Health Protection (CHP) of the Department of Health (DH) is today (June 15) closely monitoring a total of six human cases of avian influenza A(H7N9) in Tianjin, Beijing, Hebei and Jiangsu, and again urged the public to maintain strict personal, food and environmental hygiene both locally and during travel. According to the Tianjin Municipal Commission of Health and Family Planning, two patients from Langfang (Hebei) and Binhai New Area (Tianjin) were hospitalised for management of severe pneumonia. Both had contact with poultry but were not epidemiologically linked. 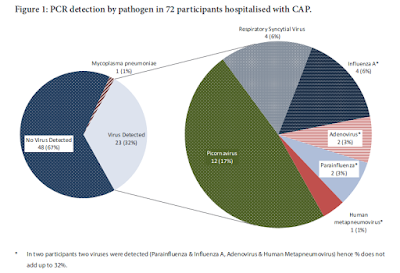 These are the first two human cases of avian influenza A(H7N9) in Tianjin. The Beijing Municipal Commission of Health and Family Planning reported an additional case affecting a female farmer aged 68 from Langfang (Hebei). She had no poultry exposure and was hospitalised for isolation and management in critical condition. In addition, three cases were notified by the National Health and Family Planning Commission. The case in Hebei affects a male farmer aged 57 from Shijiazhuang who was in serious condition. The two cases in Jiangsu affect a male farmer aged 45 from Changzhou working in a market with poultry, and a woman aged 53 from Huai'an with live poultry contact. Both were in serious condition. "H7N9 has become enzootic in poultry in the Mainland. From January 2015 to April 2016, according to the Ministry of Agriculture, poultry and environmental samples collected from markets in Anhui, Fujian, Guangdong, Hubei, Hunan, Jiangsu, Jiangxi, Jilin, Shanghai and Zhejiang tested positive for H7N9. The Food and Agriculture Organization of the United Nations revealed that positive samples in the Mainland were mainly taken from live bird markets, vendors and some commercial or breeding farms," a spokesman for the CHP said. "In view of additional human cases reported in the Mainland in warmer months as well as the recent local positive sample of faecal droppings of live poultry, the public should remain vigilant. Travellers to the Mainland and other avian influenza-affected areas in the upcoming summer vacation should not visit poultry markets, and should avoid contact with poultry and their droppings," the spokesman added. Hong Kong is just coming off their own H7N9 scare after an environmental sample - taken in the middle of May at a live bird market - tested positive for the virus. On Saturday in Hong Kong's Bird Flu Dilemma), in a televised interview Professor Kwok-Yung YUEN - who heads the Department of Microbiology at Hong Kong University - warned that the May detection may signal the virus is becoming better adapted to warmer weather. Perhaps, but the scraps of information we have right now are several examples short of a trend. Still - since the H7N9 virus is constantly evolving - we'll be keeping one eye on China throughout the summer, even though this is traditionally the off season for avian flu.